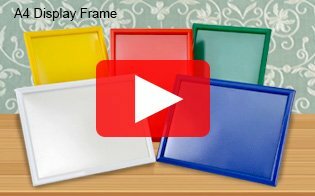 Use an A4 white frame to showcase advertisements and menus at your location! The snap frame makes it easy to change out graphics whilst mounted on your wall without any tools needed. Open the four sides of the frame, take out the lens and graphic, replace the poster and put the lens and poster back inside! Snap the four sides shut and you're frame is ready, all in less than a minute! The poster display holder, A4 white frame is versatile display able to hold A4 (210 x 297mm) graphics in portrait or landscape format. Mounting the frames on the wall is easy as well using the included hardware kit to install the display using screws and wall anchors. The screws are concealed within the frame for a professional look. The striking white colour easily draws attention and stands out to draw in passersby. If using on a desktop or countertop, there is a back kickstand that angles the stand for easy viewing in either format. A non-glare lens helps visitors view the displayed picture as well as keep grime from gathering to maintain cleanliness. 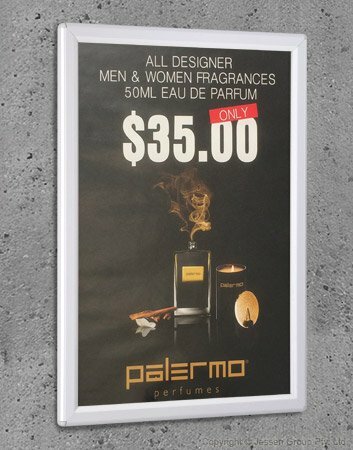 The frame itself is made from aluminium with a white finish, offering a lightweight, cheap, & durable display that is great for use in retail stores, schools, offices, car dealerships, universities, cafes, and more. Each beveled edge adds a modern look to go with the rich blue colour that truly sticks out and captures attention. Order by 2pm EST for same day despatch to anywhere in Australia when in stock!